Search through our FAQs to find the answer to your question or browse the categories below. If a customer signs up, a free Standard Membership will be taken as per default. If this figures are surpassed, a Premium Membership needs to be taken. The Premium Membership is 49,00 EUR per month (payable yearly) and 0,50 EUR per consolidated order / package. If this figures are surpassed, a Gold Membership needs to be taken. The Gold Membership is 99,00 EUR per month (payable yearly) and 0,30 EUR per consolidated order / package. Costs? Service Rates? Comparison Service-Costs. In cases of wrong or damaged products, or products which are not compliant with your order, it is, of course, no problem to have these products returned at no charge. You may even return goods to the original seller without stating reasons against a small processing fee. Please mind, that some Concierge Orders may be treated differently: if a Concierge is disocunt or special offer purchase, it may not be returnable. Customers may also return shipments from their country to us or to the original seller. Unfortunately, this may not only entail high costs but also a great deal of time. Therefore, we ask our customers to thoroughly check their order before the final placement. For this purpose, we offer our free goods inspection service. Occurring transportation and customs costs are to be taken by customer plus a 15 EUR admin fee. How can I calculate shipping costs / total costs!? – is it already (sufficiently) packed? Or do you need any further packaging services? – pick up and delivery address? Can I ship Perfume, Alcohol, or any technical devices such as Smartphones, Mobile Phones, Laptops (Lithium Ion Battery)? Can I get scans of my package documents / letters? Yes you can. You will find all that options within your account. As soon as a package / letter is shown in your Inbox you have this option available! My package is arrived in your warehouse … it is shown in my Inbox – and now? Your items have been moved from the EXPECTED BOX to the INBOX because they have reached our warehouse! You will find all relevant information in your account, such as photos, status, condition, description, weight etc. Now you need to be active: put the items you want to get forwarded into the OUTBOX. Here you will be led automatically with the next steps: you can calculate the shipping fees, you can select the shipment provider and you will be asked to pay. As soon as you have completed the payment, we will initiate the shipment! Do you accept / forward / scan letters with verification data, such as Google Adsense or any Registration Verification Letters etc. No, we do not accept such kind of letters. Do you handle the customs clearance processes? Yes, if you have chosen DHL Express, FedEx Express, or FedEx Economy. No or Probably, if you selected DHL Premium or Economy. Do you accept / receive packages from outside Europe? Please note that only shipments sent from within the EU will be accepted by us. Do you provide photos / images / photographs of my items / parcels? Yes, this service is standard and free of costs. For each incoming parcel you will find an image in your customer account > Inbox. For more detailed photos, please contact us. What telephone number must or can I specify when I order online myself? In the best case, enter your own phone number. This should normally be accepted. Should an international telephone number not be accepted, you can enter the following number (international format:) +49 152 341 43275 / (national format:) 0152 341 43275. It is a working myGermany number and is to be found in your account too. Why do the actual shipping cost differ from the previously calculated cost (Shipping Calculator)? The actual weight and actual dimensions of the parcel. The dimensional weight = Calculation basis for carriage by air. The dimensional weight is related to the size of the packing used by the seller. The dimensional weight provides an easy way to calculate the actual air freight space required for the transportation of goods, which may be low in weight and bulky at the same time. The dimensional weight of the shipment is compared with the actual weight, whereas the higher value is used to determine the freight cost or rate. This means as well, that a lightweight picture frame may turn out more expensive than a heavy television. Why? Because the picture frame is larger in size and volume than the small television. Combined length and girth = Calculation basis for the carriage by road. The combined length and girth serves as a dimensional reference for cargo loads and is measured on the basis of the parcel’s circumference in cm. If a parcel exceeds the limits specified by DHL/FedEx, the shipping will be effected on the basis of the respectively applicable rate class. These maximum lengths differ from country to country, however, as a rule of thumb, they must not exceed a value of approx. 360cm (DHL) or 762cm (FedEx) and are absolutely sufficient for standard carriage. Possible price adjustments on the part of our carriage service provider as a result of e.g. fuel surcharges (the shipping cost calculator will apply the current fuel surcharges). Can my myGermany address be used as billing / invoicing address? No. For legal reasons, reasons of traceability and consistency this is not possible. The billing address should always be your address. In cases where it is not possible, please contact us and/or provide a copy of your ID or other documents proofing your identity! Where can I find information about European sizes? Converter Sizes? Where can I find translation tools? How often and when sends myGermany packages? As often as you want. You just need to initiate this in your customer account, or have selected DROP SHIPMENT already when entering your data in the customer account. Normally, myGermany works (and sends) Monday to Friday, from 8:00 am to 6:00 pm CET. You can check the German local time here. Can you pick up items for me in Germany from private sellers? PickUp? Pick-Up? Yes, we do offer such a service (see Concierge Service). The Concierge will pick up and normally ship into our warehouse, thus you can continue to shop in Germany and we can take care for secure packaging. myGermany handles the communication and charges an extra fee of minimum 20 Euros for the pick up service into our warehouse. We try to cope it within these 20 Euro, if higher costs occur, you will be charged. Please mind that some articles are not in condition for international transport, myGermany will check that upfront and discuss with you. Can myGermany remove invoices and invoice-related documents? Yes we can. Simply check the option in your account in the OUTBOX when initiating your shipment. How can I order from German companies that do not accept international credit cards? For this you can use our Concierge Service. How big, heavy, huge can my goods be? Standard sizes / weights of packages? Limitations? Costs for unwieldy/non-stackable items? At DHL it varies from country to country. The maximum weight is between 20kg and 31.5 kg. The dimensions can usually be up to 120cm x 60cm x 60cm, the longest side must not be longer than 200cm, if one side > 60cm the other two cannot be larger than 60cm. DHL Express: Additional costs for unwieldy/non-stackable items may occur. In case your item is not stack-able DHL Express reserves the right to increase costs up to 200,00€. At FedEx the maximum weight is very high (> 1000kg). The maximum dimensions are very generously regulated: the longest side must not exceed 302cm. Additional costs for unwieldy/non-stackable items can occur, e.g. in case your item is not stack-able FedEx Economy reserves the right to increase costs up to 200,00€. For precise Information please use our Shipping Cost Calculator allowing you to determine the size of the parcel. Please also refer to the units of measure for the size of girth and volumetric weight, which may apply in extreme cases. More details, see here. Can I use myGermany immediately after I am registered? Yes. We will send you an automatic confirmation mail right away after your 1 EUR registration payment. Where/When can I use my discounts? Promotion Discounts? Registration Discounts? Registration Code? Such discounts can be used for shipment of standard packages only. It will not be applicable for freight shipments. Discount. When applies my discount? Does my discount apply to freight shipments too? Any discount applies for normal standard packages only. If you have received any discount from partner homepage while registering or any internal myGermany discount, it will not apply for freight but normal packages only. Can you ship to different Delivery Addresses? Shipping to different Shipping Addresses? Simply add as many delivery addresses as you want in your customer account. In order to validate your identity, we ask you to pay 1,00 Euro Registration Fee. You get it refunded with your next transaction! 1,00 Euro will be applied as credit to your account (reimbursed). Can I change the value of my orders/items in INBOX? Yes you can for your own orders. Please move your mouse onto the value figure in the INBOX, click and change the value as required. You cannot change the vlaue for a Concierge Order, if you have used our Concierge we are forced to use the purchase value for shipping documents. You cannot change the value if you need a Customs Declaration for your VAT refund as the amount of purchase and import needs to be the same IF you intending to get a VAT refund from seller. Can I upload / attach documents to my outgoing package (such as own invoices etc.)? Yes you can. Simply upload the document within your account in the process when initiating a shipment / package. The option will be available in the OUTBOX/CheckOut. Can I change my shipping address for a limited period of time, eg. when I am travelling? Yes. You can change your personal information such as email address or shipping address in your customer account under myData. Please mind, that we may deliver the first shipments to the name and address which is with your payment provider only. We regret if you want to cancel your account. For this purpose, please send us an email with your email address registered in the account. In this case your active account will be disabled / blocked. A data deletion is based on the statutory deadlines. The statutory retention period under German law applies. Do I need to become a member and pay a monthly fee to use myGermany? Yes, you must sign up and become a member. No, we don’t charge a monthly fee for the use of our services. What about data protection and privacy at myGermany? How does myGermany guarantee the security of my personal data? Yes, at any time. You can change your personal information such as email address, delivery address, etc. in your customer account under myAccount » personal data. Please mind, that we deliver the first shipment to the name and address which is with your payment provider. To change your billing address, please send us an eMail to service@mygermany.com. Why do you ask for 1 Euro registration fee? 1 EUR? 1,00 €? With this first registration fee we get valuable information which helps us and our payment providers to protect you, us and our partners against fraud attempts. I.e. stolen credit cards will be dedected etc. Furthermore, this helps us to deal with serious customers. This 1,00 Euro will be applied as credit to your account and refunded with your next transaction! You can change your personal information, such as email address or shipping address in your customer account under myAccount » change personal data. For changing your billing address, please send us an eMail to service@mygermany.com. Who can register at myGermany? Our services are available to corporate bodies and individuals with unrestricted legal competence. Minors may use myGermany only under parental consent. Do you forward telephone cards, SIM cards, contract-bound or pre-paid? No, we don’t forward telephone / SIM cards, normally. If you want us to do so, please contact us individually! Do you ship to Post Office Addresses, PO Boxes, or Poste Restante? We do not ship Shipments to Post Office Addresses, PO Boxes, or Poste Restante unless otherwise agreed. Some local post providers do it if requested by you. Express services always require a delivery adress where we can get a signature form the receiver. What means Drop Shipment? Is DropShipment the fastest shipping method? With DropShipment you get 10% Discount for your final Shipping Costs! We follow the FirstIn-FirstOut Concept: received packages will directly be forwarded the same day we receive them. No time-consuming opening, checking, repacking, consolidation. Thus you save 10%. Packages will be treated with utmost confidentiality, and with priority! We will notify you via eMail and in Inbox when receiving the package, you need to select the shipping options and pay/initiate the shipping order, then packages will be sent immediately without time-consuming process-steps in-between. Incoming damaged packages of course will be repacked. Does myGermany ship / deliver weapons / wepon parts? No, we do not ship such items, nor any imitations etc. Nor any of known serice provider does it internationally. If we receive such prohibited items, it will be returned at your costs, and you will be cherged a processing fee of 25,00 EUR. Do you forward credit cards, debit cards, bank card? Please refer to the Notice of No. 43 of the General Administration of Customs of the People’s Republic of China on the entry of personal mail items. The document stipulates that “the items sent from or sent to Hong Kong, Macao and Taiwan by individuals are subject to a limit of CNY 800; From or to the other countries and regions, the limit is CNY 1,000 yuan. On personal mail entry items, the Customs shall impose import duties according to the law, but the charge of import tax under CNY 50 (including CNY 50) shall not be levied. If a personal mail item entering or exiting exceeds the prescribed limit, it shall complete the formalities to be sent back or to pass through in accordance with the relevant provisions. Do you ship cargo? Freight? Bulky items? Costs? Yes we do, we ship almost everything thanks to our partners. – weight / dimensions of packed items? – description of items incl. value? – is it already sufficiently packed, or do you need any further packaging services? – where to be picked up? detailed address? – to where to be sent? detailed address? You can check costs for standard shipments here: https://mygermany.com/shipping-cost-calculator/ », for large items, please follow instructions above. Can I order food? Nutrition? Spoilage Shipments? Preserved Products? Prior Notice Note FDA? Food is in general allowed as long as it cannot spoil on its trip. So we ship packed/vacuum-packed packed items, cans, closed glasses, bottles (alcohol only up to 70%) etc. If you are not able to fill the form yourself, let myGermany help. Can you ship lithium ion batteries? In which countries? myGermany can ship technical devices containing lithium ion batteries with DHL, FedEx, DPD, GLS and UPS. Lithium Ion batteries are classified as Dangerous Goods. Beside specific shipping restrictions a special declaration has to be made. This will be done by myGermany, but can be shipped with certain partners only. Batteries alone/loose? cannot be shipped, prohibited! Batteries contained / packed / inside in equipment? can be shipped if the cells < 20Wh / battery < 100 Wh (BTW: Smartphones such as IPhones or Samsungs have approx 5,5Wh, Laptops such as MacBooks have approx 95Wh) If you are not sure, please approach myGermany before attempting to ship such items. Check here in which countries can Lithium Ion Batteries be sent? Please contact myGermany before you ship as certain ZIP codes are not available and rules are changing continuously. Do you deliver door-to-door? Door to Door delivery? If you select DHL Premium or FedEx Economy, it can be handed over to local post. Only the Express Services will guarantee a direct door-to-door delivery. Does your Concierge pick up and re-pack before you ship!? Packaging services? PickUp? Pick-Up? Can you ship to local pick up station in my country? local pick up? We normally send door-to-door with our partners because of security and service level. We are happy to consolidate your items for free and try to consider all you wishes. We will consolidate into < 30kg maximum (as per policy because of package security and employee health). We won’t charge for it. Just tell us / select in your account what order-numbers you want us to put in your next package, we’ll do it. If you want us to consolidate more heavy than > 30kg, please contact us individually for each consolidation. Additional costs will occur. After the consolidation is done we ill notify you and you can initiate the shipping process through your account. Please note, that once we have packed your parcel, you normally cannot consolidate that further (as it is already consolidated). But if you have additional wishes for that parcel (adding things or changing the packaging material etc. ), lets talk abut, but we have to ask for a little extra fee since those extra demands take up more time than you think. Can I ship used engines? motors? engines filled with oil, petrol etc.? Do I need to empty engines? We can ship new engines without any restrictions, such as chain saw, motorboad-motor, bike-motor etc. As soon as it is an used engine running with liquids (such as oil, petrol), we can ship it emptied only – and need a certificate that it was emptied by any entitled garage. Only then it can be flight as Non-Dangerous-Good. Otherwise it will be treated as Dangerous Good, which requires a lot of effort and is costly. Such certificates can not be issued by myGermany. What are the free standard services provided by myGermany!? Default services!? Can myGermany ship to Russia!? Ships up to 20KG to each address, mostly handed over to local posrt. Can ship up to 1000KG, but to company addresses only. Thus, a legal address (business address) is nedded! If ouy select EXPRESS to non-business addresses, package will be rejected and returned at your costs. Does myGermany forward to other package forwarder / package forwarding companies? such as Borderlinx etc.? How do we handle claims when items reached your country? All claims (loss or damage) must be communicated within 20 days after receipt. We fully support you, actually we prepare the claim form for you. Loss, damage and delay claims can be made via eMail, service@mygermany.com. Please mind, if you notice a damage, take pictures of the damaged inner & out package, of the damage, and also provide us with proof of value. Please note that there are restrictions in insurance coverage for certain goods. Insured is the value of the item. Transportation costs are insured to a certain extend only: The shipment rates of our partners DHL/FedEx/DBSchenker are covered. But if our additional services and material, which are added on top of partners shipping rates, are insured needs to be evaluated for each individual case (If the damage has clearly been caused by third parties, myGermany cannot be liable for the compensation of item, shipping rates partners and our services). Customs Declarations / Export Declarations for shipping values ≥ 1.000 EUR? MRN? ATLAS? VAT Refund? In case your German seller has not done it, we can do it. Additional costs are 20 Euro per 5 customs tariff numbers. What is an customs declaration? It means that customs need to release the items which will take an additional day. But it means also, that we need the original invoices / proof of purchase for each of the items. Customs Declaration and VAT Refund? We will need to fill a form with the German customs (ATLAS) and will get a MRN number, which will be sent with your package. Wehn customs in destination country received and concludes the MRN, then German customs will release the MRN and you can use that MRN for your seller as proof of shipment. Thus, he will be entitled to refund VAT (but not obligated). How are incoming parcels inspected? Checks? Inspection? Incoming parcels are opened by standard processes and inspections: First, they are recorded, photographed and assigned to your customer account. If you have entered information in your “Expected Order Box” regarding your expected goods, our staff will compare the received goods with your information. If you have not key in details, our staff will do it for you. Then we will update the status messages into your customer account in the “Inbox”. You will then receive an email notification that your goods have been received. Afterwards, the goods are repackaged and/or stored in a storage place which is specifically held ready for you. Drop shipments will not be handled like that, they will be sent directly to your address without us opening them. Can I send back / return parcels / goods which are stored at myGermany warehouse? If a consignment of goods is found to be defective caused by the original vendor, such as incorrectly transmitted or damaged goods, you can request the return of the goods to the original vendor within a period of 14 days after receipt of the goods by myGermany. This service is free of charge at myGermany and usually also free of charge at the original vendor. However, if the original sender charges a fee, these costs will be passed on to you. Should the goods not be damaged and meet your order, but you have no more interest in them, they can be returned to the original sender without indicating a reason up to 14 days after receipt by myGermany. For this service we charge a processing fee of 10 Euros. However, if the original sender charges a fee, these costs will be passed on to you. To meet the deadline, it is necessary that you inform myGermany in time so that we can resend your goods on time to the original vendor. What means combined length and girth? Combined length and girth is the alculation basis for the carriage by road. The combined length and girth serves as a dimensional reference for cargo loads and is measured on the basis of the parcel´s circumference in cm. If a parcel exceeds the limits specified by DHL/FedEx, the shipping will be effected on the basis of the respectively applicable rate class. These maximum lengths differ from country to country, however, as a rule of thumb, they must not exceed a value of approx. 360cm (DHL) or 762cm (FedEx) and are absolutely sufficient for standard carriage. What means dimensional or volumetric weight? The dimensional weight is the calculation basis for carriage by air. The dimensional weight is related to the size of the packing used by the seller. The dimensional weight provides an easy way to calculate the actual air freight space required for the transportation of goods, which may be low in weight and bulky at the same time. The dimensional weight of the shipment is compared with the actual weight, whereas the higher value is used to determine the freight cost or rate. This means as well, that a lightweight picture frame may turn out more expensive than a heavy television. Why? Because the picture frame is larger in size and volume than the small television. Business days are the days where businesses typically work in Germany, Monday to Friday. Do you offer pick up (and direct shipping) service in Germany? PickUp? Pick-Up? Can I forward my letters via myGermany? Yes, check here more details and here the costs. How do I know when my parcel has arrived? We will send you an email and show it as a status message in your customer account. We also inspect incoming goods for damage and whether they actually correspond to your order as soon as your parcel is received by us. Which countries are serviced by myGermany regarding delivery? We generally deliver parcels to all countries, except to countries where military activities are taking place. Countries served by myGermany? Does myGermany collect and store all incoming parcels automatically? Yes, the parcels are inspected and again securely packaged in our warehouse. Only when you release the goods for shipment, the parcels will be sent. No, if you have chosen Drop Shipment, then we directly forward you parcels, without the entire opening- and checking procedure. So we cannot check, but will forward your items the fastest way possible! To what extent are my parcels insured? transport insurance? Your goods are automatically covered at no extra cost up to a value of EUR 500. *Up to an order value of EUR 2,500 we charge EUR 20. *Up to an order value of EUR 25,000 we charge EUR 70. If you prefer a higher insurance, please contact us. Insurance must be purchased: 1,5% of the value but minimum 20 EUR. Goods are insured with 1 kg each at 22 EUR. *additional insurance must be purchased: for each additional 100 EUR value of goods we charge 2 EUR. Your goods are automatically covered at no extra cost up to a value of EUR 520. *Up to an order value of EUR 10,000 we charge EUR 50. Your goods are automatically covered at no extra cost up to a value of EUR 750. *Up to an order value of EUR 5,000 we charge EUR 20. Your goods are automatically covered at no extra cost up to a value of EUR 510. *additional insurance must be purchased: 1,5% of the value but minimum 10 EUR. Goods are insured. Each insurance is based on an individual calculation (as DBSchenker is used for freight only). If you do not select additional insurance, you assume all risks of loss or damage over the amount of standard liability as stated above. Insured is the value of the item. Transportation costs are insured to a certain extend only in the sense that the shipment rates of our partners DHL/FedEx/DBSchenker are completely covered, but myGermany services based on individual cases only. Liability for additional services and material, which are added on top of partners shipping rates, is to be evaluated for each individual case (If the damage has clearly been caused by third parties, myGermany cannot be liable for the insurance of your items value, shipping rates of partners, and our services/material). All claims will be evaluated individually by the partners first, then by myGermany; and are based on the declared value of goods which is done by you. How can I track my parcels? How do I know where the parcels are at this moment? Shipment Tracking? How long are the parcels stored at myGermany? Free storage? Your goods are stored free of charge for 60 days, as long as it is below 1 cbm. After 60 days of free storage, we store your parcels for an additional 60 days for a fee. In these additional 60 days we charge for each parcel 3 Euros per day for storage. Should your parcel be very large and the storage requirements higher than normal, myGermany reserves the right to adjust the storage fees accordingly. You will be notified via eMail for a storage period > 60d. In your account in INBOX you will have information about each single storage period too. Is there a variable fuel surcharge? No. All cost regarding shipment are included in the stated shipping cost. Can the parcels be sent to me neutrally packed? Yes. myGermany offers the option Discreet Shipment. By selecting Discreet Shipment parcels are forwarded to the customer ensuring that the contents or origin of the parcel are not recognizable for the recipient. This option must be selected in the customer’s account. Can the parcels be sent directly to me without rebuilding and repackaging? Yes. myGermany offers the option Drop Shipment. By selecting Drop Shipment the parcels are directly forwarded without being opened and inspected by myGermany. These parcels are also recorded and displayed in the customer’s account with the appropriate status “Forwarded”. Will my various consignments of goods be consolidated / repakced / packed together in one parcel and sent to me? Consolidation? Repacking? Yes. If you have not selected the option Dropship, myGermany will, if possible, always repack your parcels in order to ensure a favorable and safe shipment to you. We are happy to consolidate your items for free and try to consider all you wishes. We will consolidate into 30kg max (as per policy because of package security and employee health). We won’t charge for it. Just tell us / select in your account what order-numbers you want us to put in your next package, we’ll do it. After the consolidation is done we will notify you and you can initiate the shipping process through your account. Please note, that once we have packed your parcel, you normally cannot consolidate that further (as it is already consolidated). But if you have additional wishes for that parcel (adding things or changing the packaging material etc. ), lets talk abut, but we have to ask for a little extra fee since those extra demands take up more time than you think. How long does it take for the parcels to arrive at my address? The duration of shipment depends on the selected logistic provider, shipment method ans destination country. Check you country here. And as per DHL/FedEx: sometimes there are delays because of human errors, technical issues, weather etc. Such problems cant be predicted. The stated standard delivery periods are average delivery periods, and are not contractual guarantied timings. If you do not receive the item 14 working days after expected arrival time, then please we will start a tracking process. Which logistic service providers does myGermany use? We use DHL, FedEx, and DBSchenker as regular shippers, for freight we have loose collaborations with Dachser, UPS, TNT and several smaller companies. Do you ship & insure ceramic items such as vases or cooking plates, ceran plates, hot plates? We can ship, but exclude liability for ceramics such as cooking plates. Shipping of such sensitve items can not be insured by myGermany. Even the best packaging – even from the factory – can not prevent damage, as internal components always get vibrated during transport. Only a separate packaging of all internal components ensures safe transport. But this is a too much effort (at least cost of 400 EUR). How are the parcels wrapped / combined / packed at myGermany? Our employees have a lot of experience in packing parcels for international shipping. We use high-quality materials that we buy ourselves, or material submitted by FedEx and DHL Please also see here. For additional requirements we can use more than average packaging material > therefore you have an option in your account in the OUTBOX when initiating a shipment. Can I split items from the original sender and have them shipped to me in different parcels? Consolidation? Repacking? Yes. Unless otherwise agreed, we open all incoming parcels (and inspect them for damage and whether they comply with the order) and list the items in your customer account. There, you can determine which packages shall be split. Splitting one packge into two packages will cost you additionally 10 EUR. Note that if you would like us to consolidate, we do it for free. But we will consolidate into 30kg max (as per policy because of package security and employee health). Can I pick up my parcels at myGermany? No, unfortunately not at the moment as we are still a small team, but we will call you. You can ask for a Call-back or use our Live-Chat. We will call you whenever you want. In what languages can I communicate with myGermany? At what hours does myGermany work? We are in the office from Monday to Friday, 08:00 am to 06:00 pm German time, CET. Refund money? Concierge Refund? Credit to your account? We normally put an open amount directly as credit to your account, unless otherwise discussed or requested by you. This will be reckobed up with your next transaction. For a return or an exchange of goods, we execute the communication with the original vendor and take care of the return (upon your request). Possible costs for return postage (for mail orders) and allowances (for myGermany), we will calculate with your already paid money; the remaining amount less 10% concierge fee will be refunded or we calculate it to open amounts. Some online stores or eBay sellers do not accept international credit cards. Can myGermany take care of that for me? Yes, for that you can use our Concierge Service. Can myGermany pay for goods for me, which I bought (= buy it now) or bid on eBay? Buy-it-now and payments for your purchase = Yes. myGermany can not bid because of several constrains bur predominantly because of time issues. But myGermany can execute the Buy-it-now or other payments for you through our Concierge Service. Please note that eBay is a private sales platform and therefore you have no right of returning the goods. That means that myGermany also does not coordinate any returns for purchases done on eBay. For private sales, such as Ebay-Kleinanzeigen, we do not take over liability. Can myGermany buy (= buy it now) or bid for me on goods on eBay? 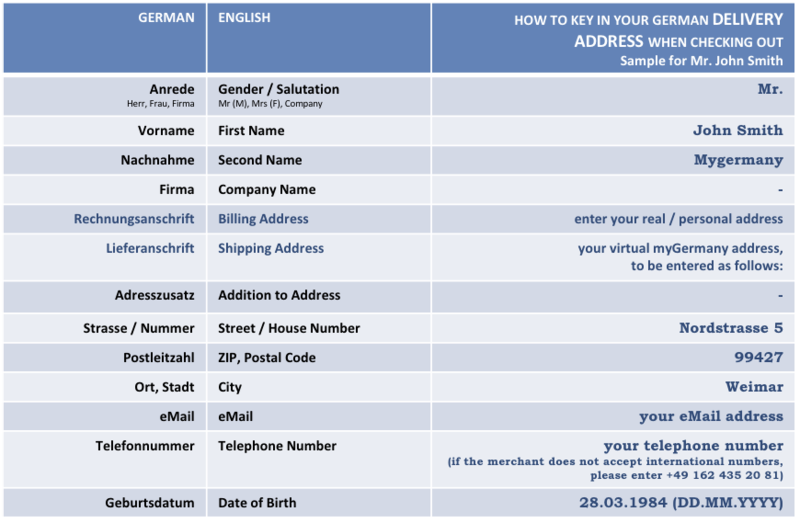 How do I correctly enter my myGermany address to the vendors? The billing address should be your own address. You can use our Concierge Service. I just ordered at a German online shop and asked to send the goods to your warehouse. What to do next? Next steps after EXPECTED BOX? Once you have placed the order to the original seller, let us know which goods you are expecting. Thus way we can check incoming goods against your order. For this please access your Expected Order Box and enter the details by clicking “Add new delivery”. If you do not specify your data, we will it do for you – then we open the parcels, identify the goods and update it in your Account. As soon as your items are in the Inbox, you need to be active: put the items you want to get forwarded into the Outbox. Here you will be led automatically with the next steps: you can calculate the shipping fees, you can select the shipment provider and you have certain other shipping options here. What happens if I have paid too much / too little for the Concierge? Paid too much – we will reckon it up with your following bill. That means you will pay this amount less. Paid too little – we will send a request for payment for the outstanding amount with your next bill. What will happen if the goods that the Concierge Service has to order are out of stock or cannot be delivered by merchant? You can either cancel the whole order or just the one item that is not available. For that you need to already specify during the order process (ie when completing the Concierge form), which of these two options you choose (the whole order or just the unavailable item will be canceled by us). Already paid fees will be refunded to you 100% on the way as you have paid for them. We will notify you if and why an item cannot be ordered. We will also ask you if you want us to order this article for you at a later time. How long does it take to execute / get items from a Concierge order? When you have completed the Concierge Service form, it is forwarded to our staff who execute the order, usually at the same day, sometimes 24-48h. If there are a lot of orders, it may take up to two days. You are informed by email and in your customer account via the Status Messages. How and when do I pay the Concierge Service? You pay directly after you submitted the Concierge Form to us. 10% will automatically be added, costs min 3,00 €. How much is the fee for the processing or cancellation of a Concierge order? 10% for the order itself (costs min 3,00 €). Nothing for the cancellation. Please mind, as long as we have not placed your order, you can edit or cancel the Concierge order. You can do this in your account in myOrders in the Expected-Item-Box. Fees already paid will be refunded to 100% on the way in which you have paid the fees. Once we have placed the order at the original vendor (usually one to two days after you have sent the form to us), a change or a cancellation is no longer possible. However, you can have the goods you no longer like returned to the vendor up to 14 days after receipt by myGermany once they have been received in our warehouse. This option can also be found on your account in myOrders in the Inbox. For this service we charge a processing fee of 10 Euros. However, if the original sender charges a fee, these costs will be passed on to you. Can I modify or cancel a Concierge order? Yes, you can. As long as we have not placed your order, you can edit or cancel the Concierge order. You can do this in your account in myOrders in the Expected-Item-Box. Fees already paid will be refunded to 100% on the way in which you have paid the fees. Once we have placed the order at the original vendor (usually one to two days after you have sent the form to us), a change or a cancellation is no longer possible. However, you can have the goods you no longer like returned to the vendor up to 14 days after receipt by myGermany once they have been received in our warehouse. This option can also be found on your account in myOrders in the Inbox. For this service we charge a processing fee of 10 Euros. However, if the original sender charges a fee, these costs will be passed on to you. To meet the deadline, it is necessary that you inform myGermany in time so that we can resend your goods on time to the original vendor. Can I return orders that the concierge has ordered for me (that are in the myGermany warehouse)? In cases where shipments contain wrong or damaged, caused by the original seller, resp. products which are not compliant with the order (e.g. wrong size, colour, or general specifications), it is, of course, no problem to have these products returned, normaly at no charge. In case, costs will occure, we will pass it on to you. For returing hoods you need to consider a certain period of 14 days. You may even return goods to the original seller without stating any reasons (e.e you changed your opinion). This service comes with a fee of ten Euros (in addition to the costs that may be charged by the original seller). Costs incurred by the original seller will be passed on to you, too. Please consider a that the return can only be happen within 14 days after receipt of your goods in our warehouse. Possible costs for return postage (for mail orders) and allowances (for myGermany), we will calculate with your already paid money; the remaining amount less 10% concierge fee will be refunded or we calculate it to open amounts. The revocation period of 14 days is important. So take care to inform myGermany in time about returns, so that we can return your goods in time to the original seller. Is it possible to have the goods sent directly to me, rather than first to the myGermany warehouse? De Minimis Value for your country. Import Duty? Tax? Duty Free Limits? Can I get my VAT refunded, while / after using your service? VAT Refund? Value Added Tax Refund? For items < 1000EUR and you purchase (billing address needs to be your address): Speak to the merchant and he can refund the VAT after we sent you/him the export documents. Be aware: refunding VAT is a can, not must…means the merchant has the power to say No. If he agrees, we will provide 2-3 weeks after delivery the papers / proof of the customs that we really exported the item outside of EU! Along with a small letter of yours he will refund the VAT to you…. Speak to merchant, you will get a MRN number with the export from us. With that it is easy to refund the VAT. An additional declaration export document is to be prepared (costs 20EUR per 5 customs tariff numbers). We will buy it for you and sell it to you without VAT. We take a fee of 10% (min. 3EUR) and you cannot “fine-tune” any customs values as we declare it with the value we bought it (we are liable for that in that case). You simply need to initiate the Concierge (https://mygermany.com/pickup-concierge-service-germany/) and put a small line in the comment that you have spoken to us. If you have already purchased at merchant and want myGermany to return VAT afterwards, we may be able to help, but allow us to take a VAT refund processing fee of 40 EUR. How will the import tax or customs duties be calculated? When do I pay for customs duties and import tax? Calculation of import tax by customs? Conclusion of value of items? How is the information / description of the goods concluded for the customs declaration? Customs duties and taxes must be paid after the goods have arrived at your destination country. They must be paid by you – the buyer and importer. Most often you may pay this to our partner DHL or FedEx after the delivery, they will charge you later via letter. What is the customs value of my goods? The customs value of goods is the value that is the basis for the calculation of the customs duties. It is composed of the invoice amount and the shipping costs. The customs value is always determined by the customs office. How is the information / description of the goods concluded for the shipping documents / customs declaration? If you use the Concierge Service, we take the data from the Concierge form. If you have purchased the goods yourself, you will need to enter data (such as description and value etc.) regarding your order in the Expected-Items-Box in your customer account (under myOrder), so that myGermany can assign incoming parcels to your order. Taking your data we create the customs declaration. Please make understandable and truthful statements to avoid any misunderstanding. That means: you need to enter data before your package reaches our warehouse! Are all customs duties and taxes included in the shipping rates? Do I need to request a special invoice from the original seller / vendor for the forwarding process? Or will myGermany issue the required documents for the customs? You must not request a special invoice. In order to send goods to a foreign country, certain formal requirements for the exporting country (export declaration), as well as for the importing country (proforma invoice) must be met. myGermany handles the creation of the necessary paperwork. Therefore it is important that you provide us with the goods description when you bought the items yourself (meaning you have not used our Concierge Service). You can do this in the customer’s account in myOrders in the Expected Items Box. Who pays for possible custom duties? You as the “importer” pay all customs duties. Parcels are subject to random checks by Customs. If customs duties incur, they will be due when the parcel arrives in the target country. Either the logistic partner pays the duties in advance (most often you may pay this to our partner DHL or FedEx after the delivery, they will charge you later via letter), or you will be asked to pick up that parcel in a post office where you have to pay the duties. Where can I find information on whether or if customs duties for which goods must be paid? For an easy overview just switch to our Country Guide. German export conditions, Find more information here: Customs. Conditions that apply in your country. Please inform yourself at your customs office. Conditions of our logistics partner DHL and FedEx. Where can I find information about which products may be shipped to my country? For an easy overview just switch to our Country Guide or Restricted items. What does myGermany not ship? Prohibited or restricted items? That depends on the destination and on the specifications of our logistic partners. Here we have listed more information: Prohibited items. In which currency do I pay? You pay always in Euros for the goods. Via our Currency Converter you can convert the amount to check how much it costs in your currency. In certain FREIGHT cases only, we can use 3rd party provider to get paid in your currency > please speak to us. Why do I need to pay VAT (Value Added Tax) on the shipping charge or the number of goods? You only pay VAT if myGermany purchases goods within the European Union. According to the Tax Act, delivery within the EU is relevant for VAT. Shipping to third countries is tax-exempted and the tax is not listed on the shipping bill. You only pay VAT when you purchase goods within the European Union. According to the Tax Act, delivery within the EU is relevant for VAT. Shipping to third countries are tax-exempted and the tax is not listed on the bill. Sales to third countries (from myGermany to customers) always take place without VAT. Which payment method does myGermany accept? Crypto, BitCoin, CreditCard, PayPal, AliPay, ApplePay, WeChat? We accept all major credit cards, PayPal and various country-specific methods. For details please see Payment Information. What & How much does the myGermany services cost? Costs of myGermany? How does it work? If you use our Concierge Service then there are costs involved: 10 % Concierge fee (costs min 3,00 €) and/or 20 EUR pick up fee if you want us to pick up your item. value, dimensions (HxLxW) and weight of packed items / packages? is it sufficiently packed already or do you need any further packaging services? What if I have no credit card? Then you can either use PayPal, or make money transfers via wire transfer. In the latter case please contact us. Are my myGermany-invoices attached to the parcels sent by myGermany? No, your bills can be downloaded in the customer’s account in myAccount. Any other / merchant invoices are attached as you require. Within your account (while in the shipping-initiating-process in the OUTBOX) you have the option to remove all invoice-relevant documents. You can also upload your own documents to an outgoing package > within the shipment-initiation-process in your account / OUTBOX. Will I get a VAT / non-VAT invoice from myGermany? Your bills can be downloaded in the customer’s account in myAccount. VAT or non-VAT is simply defined by your country / the destination country.